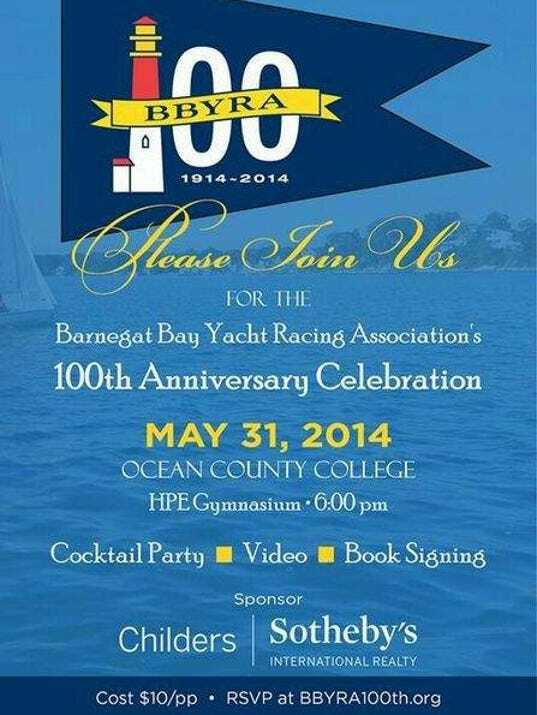 The Barnegat Bay Yacht Racing Association, www.bbyra.org, is an association of, currently, 14 yacht or sailing clubs from around the Barnegat Bay: The Seaside Park YC, the Bay Head YC, the Island Heights YC, the Ocean Gate YC, the Mantoloking YC, the Lavallette YC, the Toms River YC, the Shore Acres YC, the Beachwood YC, the Metedeconk River YC, the Normandy Beach YC, the Manasquan River YC, the Pine Beach YC, and the Ocean County College SC. The association coordinates between the member clubs and in the summer organises weekly championships series for a number of design classes. The association depicts on their website a 3:5 rectangular blue burgee with a lit red and white lighthouse. Judging by its characteristics, the lighthouse is an abstraction of Old Barney, the Barnegat Lighthouse. The association was founded in 1914, by the first four clubs from the above list (the others are in the order of being elected in). Lloyd's Register of American Yachts, 1917, indeed lists the association. They lists seven members: The first six from the list plus the Seaside Heights YC, not mentioned on the association's website, and apparently long since disappeared. Lloyd's pictures the burgee of that time as a very dark blue rectangle, ca. 2:3, with in white the letters B, B, Y, R, and A, placed in the four corners and the centre, in reading order. A tribar light grey over white flag, with the corners and the centre countercharged with the letters, B, B, Y, R, and A. On the upper light grey the title in black: "LADIES" "CHAMPION" in two lines, resp. "CHAMPION" in a larger font. On the lower stripe in dark grey the year, 1915. A possible colour scheme would be blue and white as shown. As champion flags are often based on a club's burgee, it may be that what we see here is an even earlier pattern of the association's burgee, but it then again, that might not be the case. Champion flags still exist, though the number must have increased with the number of classes, now 12. At the Normandy Beach Yacht Club's 2011 photo page, nbycnj.com/11photos.htm#AwardsCeremony, a more recent specimen can be seen: nbycnj.com/images/11/002.jpg. It's again Old Barney on a blue field, though in a different style, and beside the light house stand red digits 20 and 11, to indicate the year. Above the charge is the class name in red capital letters, in this case "LASER RADIAL", below the charge also in RED capitals the title "CLASS CHAMPION". Visible in the same image, is a rooster pennant: Dark blue with a white rooster and underneath at the hoist the abbreviation BYC and at the fly 11. As with other racing associations, the BBYRA races in different locations are hosted by different clubs. Going by the markings and the caption, this is the winners pennant for the 2011 race hosted by the Beachwood Yacht Club. The champion also holds a plaque for her having won at Seaside Park Yacht Club. This seems slightly odd to me, as I would expect either both to be pennants or both to be plaques. Another rooster pennant can be seen at the 839 South Drive blog: 829southdrive.blogspot.nl/2014_06_01_archive.html. It's from 1973, but only has a rooster. The reason for this appears to be that, as can be seen slightly lower on the page, race pennants were blue broad pennants with the club abbreviation and the two year digits in white. The winner of each race would receive the rooster pennant, for that class, to take home for that week. It then had to be brought to the next race to be contended again. Finally, the winner of the last race would get to take home that year's rooster pennant and keep it. Similar to the names of winners on a cup, during the season each winner would add their name on the heading of the rooster pennant, thus creating a log of the winners of the pennant for that year. The final flag at 829southdrive.blogspot.nl/2014_06_01_archive.html is described as a "qualifying banner". To "qualify" in a race series means ones score is valid for the championship. This usually requires starting in a specific number of races (typically half the races in friendly competition or all but a small number of allowable forfeits in competitions where people value the results above the races). I assume this then is a banner all those who qualified would receive that year. It's again the Barnegat Lighthouse on a blue field with two stripes underneath, this time apparently with red digits 19 and 53 in the bottom corners to indicate the year. Not enough is visible to be sure of the details though. The BBYRA has now been in existence for more than a century. For that centennial a website was set up, www.bbyra100th.org, which also promotes a book and film project on the association, aptly named "Chasing Roosters". Checking this further suggests that the design for the burgee may actually be slightly different: at www.gannett-cdn.com/ is still online an invitation for the 100th Anniversary Celebration. It features a forked burgee with the above mentioned logo, but with the stripes under the lighthouse removed, and with the lighthouse, being closer to the hoist, larger than the 00 . With all these variations, I'm wondering how many more flags there are that I didn't run into this time. I'm quite sure I've seen a flag like the qualifying banner before, though I can't recall where, at the moment. But in a series of a century there may have been quite a bit of variation over the years.